Here's to another year of love & laughter! Pamper your loved ones with the freshest gift combo! 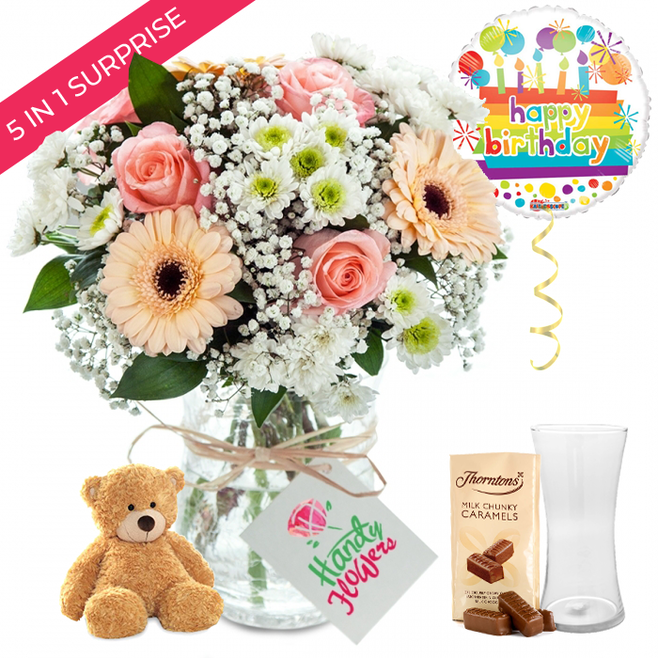 5 gifts in 1 including: joyful bouquet, birthday balloon, sweet candies, teddy bear and vase. My daughter was really pleased with her delightfully, bright and dazzling birthday flowers. She stated that the bouquet was as fresh as can be, and that the fragrance was uplifting, made her flat spark up a bit, which made me happy. You can tell their flowers are always hand-selected and this shows the level of commitment and professionalism Handy Flowers puts into their business. I definitely recommend them. Outstanding flowers, and clearly designed by some very experienced florists. I have never seen flowers that were more perfect. The arrangement was full of vibrant and lovely flowers. I never thought I would say flowers were superb, but the ones I ordered from you were! Thank you so much. Another fantastic flower arrangement! I always get the best flowers in every arrangement I order from you!